Fairchild Semiconductor International, Inc. was an American semiconductor company based in San Jose, California. Founded in 1957 as a division of Fairchild Camera and Instrument, it became a pioneer in the manufacturing of transistors and of integrated circuits. Schlumberger bought the firm in 1979 and sold it to National Semiconductor in 1987; Fairchild was spun off as an independent company again in 1997. In September 2016, Fairchild was acquired by ON Semiconductor. The company has locations in the United States at San Jose, California; South Portland, Maine; West Jordan, Utah; and Mountaintop, Pennsylvania. Outside the U.S. it operates locations in Singapore; Bucheon, South Korea; Penang, Malaysia; Suzhou, China; and Cebu, Philippines, among others. In 1956, William Shockley opened Shockley Semiconductor Laboratory as a division of Beckman Instruments in Mountain View, California; his plan was to develop a new type of "4-layer diode" that would work faster and have more uses than then-current transistors. At first he attempted to hire some of his former colleagues from Bell Labs, but none were willing to move to the West Coast or work with Shockley again at that time. Shockley then founded the core of the new company with what he considered the best and brightest graduates coming out of American engineering schools. While Shockley was effective as a recruiter, he was less effective as a manager. A core group of Shockley employees, later known as the traitorous eight, became unhappy with his management of the company. The eight men were Julius Blank, Victor Grinich, Jean Hoerni, Eugene Kleiner, Jay Last, Gordon Moore, Robert Noyce, and Sheldon Roberts. Looking for funding on their own project, they turned to Sherman Fairchild's Fairchild Camera and Instrument, an Eastern U.S. company with considerable military contracts. In 1957 the Fairchild Semiconductor division was started with plans to make silicon transistors at a time when germanium was still the most common material for semiconductor use. According to Sherman Fairchild, Noyce's impassioned presentation of his vision was the reason Sherman Fairchild had agreed to create the semiconductor division for the traitorous eight. Noyce advocated the use of silicon as substrate – since the material costs would consist of sand and a few fine wires, the major cost would be in the manufacturing process. Noyce also expressed his belief that silicon semiconductors would herald the start of disposable appliances that, due to cheap electronic components, would not be repaired but merely discarded when worn out. Their first transistors were of the silicon mesa variety, innovative for their time, but relatively poor reliability. Fairchild's first marketed transistor was the 1958 2N697, a mesa transistor developed by Moore, and it was a huge success. The first batch of 100 was sold to IBM for $150 a piece in order to build the computer for the B-70 bomber. More were sold to Autonetics to build the guidance system for the Minuteman ballistic missile. At the same time Jean Hoerni developed the planar process which was a huge improvement – transistors could be made more easily, at a lower cost and with higher performance and reliability. The planar process made most other transistor processes obsolete. One such casualty was Philco's transistor division, whose newly built $40 million plant to make their germanium PADT process transistors became unviable. Within a few years every other transistor company paralleled or licensed the Fairchild planar process. Hoerni's 2N1613 was a major success, with Fairchild licensing the design across the industry. In 1960 Fairchild built a circuit with four transistors on a single wafer of silicon, thereby creating the first silicon integrated circuit (Texas Instruments' Jack Kilby had developed an integrated circuit made of germanium on September 12, 1958, and was awarded a U.S. patent). The company grew from twelve to twelve thousand employees, and was soon making $130 million a year. Fairchild's Noyce and Texas Instrument's Kilby had independently invented the integrated circuit (IC) based on bipolar technology. In 1960, Noyce invented the planar integrated circuit. The industry preferred Fairchild's invention over Texas Instruments' because the transistors in planar ICs were interconnected by a thin film deposit, whereas Texas Instruments' invention required fine wires to connect the individual circuits. Noyce's invention was enabled by the planar process developed by Jean Hoerni. In the early 1960s, Fairchild R&D began development of MOSFET (metal–oxide–semiconductor field-effect transistor) technology, which had been pioneered by RCA and Bell Labs. The experiments led to Fairchild's development of MOS integrated circuits. In 1963, Fairchild hired Robert Widlar to design analog operational amplifiers using Fairchild's process. Since Fairchild's processes were optimized for digital circuits, Widlar collaborated with process engineer Dave Talbert. The collaboration resulted in two revolutionary products – µA702 and µA709. Hence, Fairchild dominated the analog integrated circuit market, having introduced the first IC operational amplifiers, or "op-amps", Bob Widlar's µA702 (in 1964) and µA709. In 1968, Fairchild introduced David Fullagar's µA741, which became the most popular IC op amp of all time. By 1965 Fairchild's process improvements had brought low-cost manufacturing to the semiconductor industry – making Fairchild nearly the only profitable semiconductor manufacturer in the United States. Fairchild dominated the market in DTL, op-amps and mainframe computer custom circuits. In 1965, Fairchild opened a semiconductor assembly plant on a Navajo Reservation in Shiprock, New Mexico. At its peak, the plant employed over a thousand Navajos, the majority of whom were women. In The Shiprock Dedication Commemorative Brochure released by the Fairchild company, the Indian women circuit makers were celebrated as "culture workers who produced circuits as part of the 'reproductive' labor of expressing Navajo culture, rather than merely for wages." This claim was based on the opinion that circuits of the electronic chips had a mere resemblance with the rectangular patterns on the Navajo rugs. Paul Driscoll, the Shiprock plant manager, spoke of the "untapped wealth of natural characteristics of the Navajo...the inherent flexibility and dexterity of the Indians." Although highly successful during its operation, the plant was closed in 1975. While the Fairchild corporation claims the Navajo women were chosen to work in the Shiprock plant due to their "'nimble fingers'" as previously noted, the women of the Shiprock reservation were actually chosen as the workforce due to a lack of labor rights asserted by the women in addition to "cheap, plentiful workers and tax benefits". Fairchild had not done well in the digital integrated circuit market. Their first line of ICs was the "micrologic" resistor–transistor logic (RTL) line which was used in the Apollo Guidance Computer. It had the advantage of being extremely simple – each inverter consisted of just one transistor and two resistors. The logic family had many drawbacks that had made it marginal for commercial purposes, and not well suited for military applications: the logic could only tolerate about 100 millivolts of noise – far too low for comfort. It was a while before Fairchild relied on more robust designs, such as diode–transistor logic (DTL) which had much better noise margins. Sales due to Fairchild semiconductor division had doubled each year and by the mid-1960s comprised two-thirds of total sales of the parent company. In 1966, Fairchild's sales were second to those of Texas Instruments, followed in third place by Motorola. Noyce was rewarded with the position of corporate vice-president and hence became the de facto head of the semiconductor division. However, internal trouble at Fairchild began to surface with a drop in earnings in 1967. There was increasing competition from newer start-ups. The semiconductor division, situated in Mountain View and Palo Alto, California, was actually managed by executives from Syosset, New York, who visited the California sites once a year, even though the semiconductor division earned most of the profits of the company. Fairchild's president at that time, John Carter, had used all the profits to fund acquisitions of unprofitable ventures. Noyce's position on Fairchild's executive staff was consistently compromised by Sherman Fairchild's faction. Charles E. Sporck was Noyce's operations manager. Sporck was reputed to run the tightest operation in the world. Sporck, Pierre Lamond and most managers had grown upset and disillusioned with corporate focus on unprofitable ventures at the expense of the semiconductor division. Executives at the semiconductor division were allotted substantially fewer stock options compared to other divisions. In March 1967, Sporck was hired away by Peter J. Sprague to National Semiconductor. Sporck brought with him four other Fairchild personnel. Actually, Lamond had previously assembled a team of Fairchild managers in preparation to defect to Plessey, a British company. Lamond had recruited Sporck to be his own boss. When negotiations with Plessey broke down over stock options, Lamond and Sporck succumbed to Widlar's and Talbert's (who were already employed at National Semiconductor) suggestion that they look to National Semiconductor. Widlar and Talbert had earlier left Fairchild to join Molectro, which was later acquired by National Semiconductor. In the fall of 1967, Fairchild suffered a loss for the first time since 1958 and announced write-offs of $4 million due to excess capacity, which contributed to a total loss of $7.6 million. Profits had sunk to $0.50 a share, compared to $3 a share the previous year, while the value of the stock dropped in half. In October 1967, the board ordered Carter to sell off all of Fairchild's unprofitable ventures. Carter responded to the order by resigning abruptly. Furthermore, Fairchild's DTL technology was being overtaken by Texas Instruments's faster TTL (transistor–transistor logic). While Noyce was considered the natural successor to Carter, the board decided not to promote him. Sherman Fairchild led the board to choose Richard Hodgson. Within a few months Hodgson was replaced by a management committee led by Noyce, while Sherman Fairchild looked for a new CEO other than Noyce. In response, Noyce discreetly planned a new company with Gordon Moore, the head of R&D. They left Fairchild to found Intel in 1968 and were soon joined by Andrew Grove and Leslie L. Vadász, who took with them the revolutionary MOS Silicon Gate Technology (SGT), recently created in the Fairchild R&D Laboratory by Federico Faggin who also designed the Fairchild 3708, the world’s first commercial MOS integrated circuit using SGT. Fairchild MOS Division was slow in understanding the potential of the SGT which promised not only faster, more reliable, and denser circuits, but also new device types that could enlarge the field of solid state electronics – for example, CCDs for image sensors, dynamic RAMs, and non-volatile memory devices such as EPROM and flash memories. Intel took advantage of the SGT for its memory development. Federico Faggin, frustrated, left Fairchild to join Intel in 1970 and design the first microprocessors using SGT. Among the investors of Intel were Hodgson and five of the founding members of Fairchild. Sherman Fairchild hired Lester Hogan, who was the head of Motorola semiconductor division. Hogan proceeded to hire another hundred managers from Motorola to entirely displace the management of Fairchild. The loss of these iconic executives, coupled with Hogan's displacement of Fairchild managers demoralized Fairchild and prompted the entire exodus of employees to found new companies. Many of the original founders, otherwise known as the "fairchildren", had left Fairchild in the 1960s to form companies that grew to prominence in the 1970s. Robert Noyce and Gordon Moore were among the last of the original founders to leave, at which point the brain-drain of talents that had fueled the growth of the company was complete. Hogan's action to hire from Motorola had Motorola file a lawsuit against Fairchild, which the court then decided in Fairchild's favor in 1973. Judge William Copple ruled that Fairchild's results were so unimpressive that it was impossible to assess damages "under any theory." Hogan was dismissed as president the next year, but remained as vice chairman. In 1973, Fairchild became the first company to produce a commercial charge-coupled device (CCD) following its invention at Bell Labs. Digital image sensors are still produced today at their descendant company, Fairchild Imaging. The CCD had a difficult birth, with the devastating effects on Fairchild of the 1973–75 recession that followed on the 1973 oil crisis. After Intel introduced the 8008 8-bit microprocessor, Fairchild developed the Fairchild F8 8-bit microprocessor, which was according to the CPU Museum "in 1977 the F8 was the world's leading microprocessor in terms of CPU sales." In 1976, the company released the first video game system to use ROM cartridges, the Fairchild Video Entertainment System (or VES) later renamed Channel F, using the F8 microprocessor. The system was successful initially, but quickly lost popularity when the Atari 2600 Video Computer System (or VCS) was released. By the end of the 1970s they had few new products in the pipeline, and increasingly turned to niche markets with their existing product line, notably "hardened" integrated circuits for military and space applications and isoplanar ECL products used in exotic applications like Cray Computers. Fairchild was being operated at a loss, and the bottomline subsisted mostly from licensing of its patents. In 1979, Fairchild Camera and Instrument was purchased by Schlumberger Limited, an oil field services company, for $425 million. At this time, Fairchild's intellectual properties, on which Fairchild had been subsisting, were expiring. In 1980, under Schlumberger management, the Fairchild Laboratory for Artificial Intelligence Research (FLAIR) was started within Fairchild Research. In 1985 the lab was separated to form Schlumberger Palo Alto Research (SPAR). Fairchild research developed the Clipper architecture, a 32-bit RISC-like computer architecture, in the 1980s, resulting in the shipping of the C100 chip in 1986. The technology was later sold to Intergraph, its main customer. Schlumberger sold Fairchild to National Semiconductor in 1987 for $200 million. The sale did not include Fairchild's Test Division, which designed and produced automated test equipment (ATE) for the semiconductor manufacturing industry, nor did it include Schlumberger Palo Alto Research. In 1997, the reconstituted Fairchild Semiconductor was reborn as an independent company, based in South Portland, Maine with Kirk Pond as CEO. On March 11, 1997, National Semiconductor Corporation announced the US$550 million sale of a reconstituted Fairchild to the management of Fairchild with the backing of Sterling LLC, a unit of Citicorp Venture Capital. Fairchild carried with it what was mostly the Standard Products group previously segregated by Gil Amelio. The Fairchild Semiconductor Corporation announced November 27, 1997 that it would acquire the semiconductor division of the Raytheon Corporation for about $120 million in cash. The acquisition was completed on December 31, 1997. In December 1998, Fairchild announced the acquisition of Samsung's power division, which made power MOSFETs, IGBTs, etc. The deal was finalized in April 1999 for $450 million. To this day, Fairchild remains an important supplier for Samsung. In August 1999, Fairchild Semiconductor again became a publicly traded company on the New York Stock Exchange with the ticker symbol FCS. Fairchild's South Portland, Maine and Mountaintop, Pennsylvania locations are the longest continuously operating semiconductor manufacturing facilities in the world, both operating since 1960. On September 6, 2001 Fairchild Semiconductor announced the acquisition of Impala Linear Corporation, based in San Jose, CA for approximately $6 million in stock and cash. Impala brought with it expertise in designing analog power management semiconductors for hand-held devices like laptops, MP3 players, cell phones, portable test equipment and PDA's. On January 9, 2004, Fairchild Semiconductor CEO Kirk Pond was appointed as a Director of the Federal Reserve Bank of Boston, elected by member banks to serve a three-year term. On April 13, 2005, Fairchild announced appointment of Mark Thompson as CEO of the corporation. Thompson would also be President, Chief Executive Officer and a member of the board of directors of Fairchild Semiconductor International. He originally joined Fairchild as Executive Vice President, Manufacturing and Technology Group. On March 15, 2006 Fairchild Semiconductor announced that Kirk P. Pond would retire as Chairman at the company's annual stockholders' meeting on May 3, 2006. Pond would continue as a member of the company’s board of directors. Mark Thompson, then CEO, became Chairman. On September 1, 2007, New Jersey-based RF semiconductor supplier Anadigics acquired Fairchild Semiconductor's RF design team, located in Tyngsboro, Massachusetts, for $2.4 million. ^ a b "About Fairchild - Overview of Fairchild Semiconductor Company". Fairchild. Retrieved January 8, 2014. ^ a b c d e "Financial Statements for Fairchild Semiconductor Intl Inc - Google Finance". Retrieved 7 March 2017. ^ Leslie R Berlin. 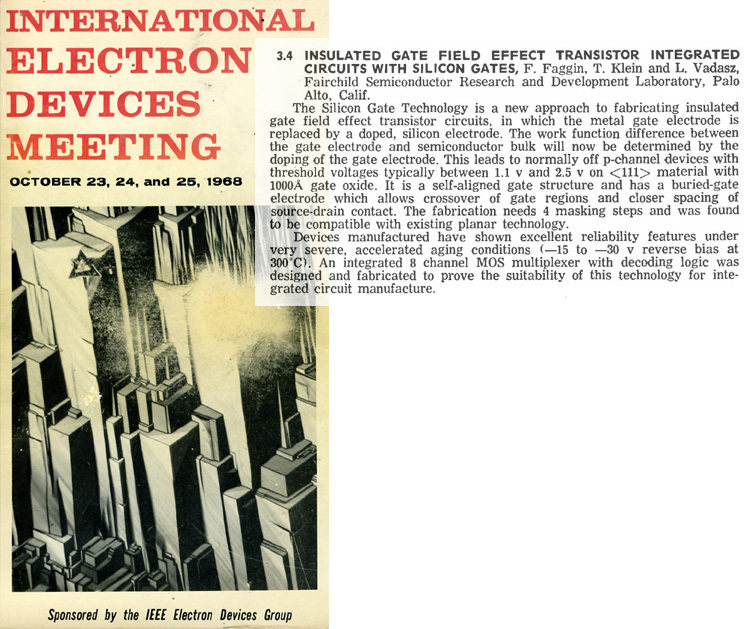 "Robery Noyce and Fairchild Semiconductor, 1957-1968" (PDF). People.seas.harvard.edu. Business History Review. Retrieved 2016-01-08. ^ Jeffrey S. Young (1998). Greatest Technology Stories. John Wiley and Sons. p. 118. ISBN 0-471-24374-4. ^ "Transistor Museum Photo Gallery Fairchild 2N697 Silicon Mesa Transistor". Semiconductormuseum.com. Retrieved 2016-01-08. ^ "Silicon Mesa Transistors Enter Commercial Production". computerhistory.com. Retrieved 2018-09-21. ^ Christophe Lécuyer (2006). Making Silicon Valley: Innovation and the Growth of High Tech, 1930-1970. MIT Press. pp. 214–252. ISBN 978-0-262-12281-8. ^ Chih-Tang Sah (30 October 1991). Fundamentals of Solid State Electronics. World Scientific Publishing Co Inc. pp. 525–. ISBN 978-981-310-349-8. ^ Linden T. Harrison (22 August 2005). Current Sources and Voltage References: A Design Reference for Electronics Engineers. Newnes. pp. 3–. ISBN 978-0-08-045555-6. ^ Rakesh Kumar Garg; Ashish Dixit; Pavan Yadav (1 January 2008). Basic Electronics. Firewall Media. pp. 331–. ISBN 978-81-318-0302-8. ^ Nakamura, Lisa. "Indigenous Circuits". Computer History Museum. Retrieved 21 January 2016. ^ Nakamura, Lisa (December 2014). "Indigenous Circuits:Navajo Women and the Racialization of Early Electronic Manufacture" (PDF). American Quarterly. 66 (4): 919–941. Retrieved 21 January 2016. ^ Nakamura, Lisa (2014-12-15). "Indigenous Circuits: Navajo Women and the Racialization of Early Electronic Manufacture". American Quarterly. 66 (4): 919–941. doi:10.1353/aq.2014.0070. ISSN 1080-6490. ^ Jeffrey S. Young (1998). Greatest Technology Stories. John Wiley and Sons. p. 127. ISBN 0-471-24374-4. ^ a b Laws, David (January 7, 2015). "Who named Silicon Valley?". Computer History Museum. Retrieved 16 October 2018. ^ Rhett Morris (July 26, 2014). "The First Trillion-Dollar Startup". Tech Crunch. Retrieved February 22, 2019. ^ Martin, Douglas (August 16, 2008). "Lester Hogan's obituary - New York Times". The New York Times. ^ Bob Johnstone (1999). We were burning: Japanese entrepreneurs and the forging of the electronic age. Basic Books. pp. 175–211. ISBN 978-0-465-09118-8. ^ Laws, David. "The Legacy of Fairchild" (PDF). Computer History Museum’s Visible Storage Exhibit. ^ R. J. Brachman (Winter–Spring 1983). "Research at Fairchild". AI Magazine. 4 (1): 45–46. ISSN 0738-4602. ^ "Do Oil and Data Mix?". Forbes. Retrieved 2016-01-08. ^ "Acquisition of Raytheon's semiconductor division". Electronic News. January 12, 1998. ^ Stephan Ohr (December 21, 1998). "Fairchild acquires Samsung power group". EE Times. ^ "Fairchild Semiconductor Completes the Acquisition of Samsung Electronics' Power Device Division. - Free Online Library". Thefreelibrary.com. Retrieved 2016-01-08. ^ "Electronics Engineering Blog | Fairchild - Samsung Mobile Rewards Fairchild As The Only Supplier To Consecutively Win Their Coveted Supply Chain Management Award!". Blog.fairchildsemi.com. Archived from the original on 2016-03-03. Retrieved 2016-01-08. ^ "Kirk Pond appointed as a Director of the Federal Reserve Bank of Boston". Business Wire. January 9, 2004. ^ "Fairchild announces appointment of Mark Thompson as CEO". Powerelectronics.com. Retrieved 2016-01-08. ^ "Fairchild Semiconductor announces Kirk Pond's retirement as Chairman". Powerpulse.net. Retrieved 2016-01-08. ^ King, Ian. "Fairchild to Close Plants, Cut Up to 15% of Workforce". Bloomberg. Retrieved 17 January 2017. Wikimedia Commons has media related to Fairchild Semiconductor. IT Corporate Histories Collection link to Fairchild Semiconductor history content on the Computer History Museum site. Buying Tomatoes at the Birthplace of Silicon Valley: What happened to the original Fairchild site and to Shockley Lab. The Silicon Gate Technology, developed at Fairchild in 1968 by F. Faggin et al., was presented at the IDEM in Washington DC, in Oct. 1968.